The Delta Blues together with Americana-roots? 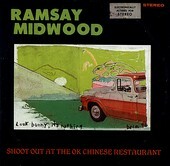 Ramsay Midwood's Shoot Out At The OK Chinese Restaurant says its true. His deep, rich blues voice together with an acoustic guitar and a backing band that plays roots music, Midwood's sound calls upon the two genres while he brings his own influence to the table, bending and molding the sounds he likes to come up with something uniquely his own. Midwood proves on Shoot Out At The OK Chinese Restaurant that he's the real deal. I'll give it a B.